What’s On My Design Wall? This week it’s the blocks to my Ladder to the Stars. They’ve been made since early May, waiting for the paper pieced sashings. Paper piecing is not high on my list of fun things to do. 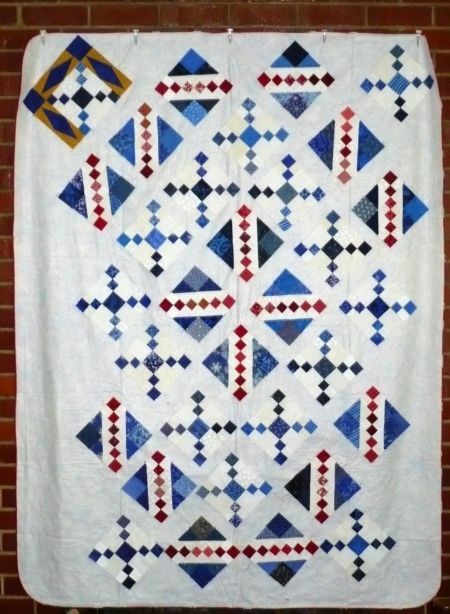 When I designed this quilt using 12″ blocks, I had the size of the fabric for the gold points worked out to “a science”. I haven’t got that “science” figured out yet, so I’ve put off the sashings. So, my goal this week is to figure out the paper piecing so I don’t have to think and get a few more sashings done. I am not going to attempt to get all of them done (80 total are needed) as I need continue working on the hand quilting on my nephew’s quilt and make this month’s Kansas Spirit block. Sometimes I procrastinate just to keep from figuring things out but most often, it ends up being not nearly as hard as I had feared. Hope you can get it all figured out this week. Good luck with the quilting and block.